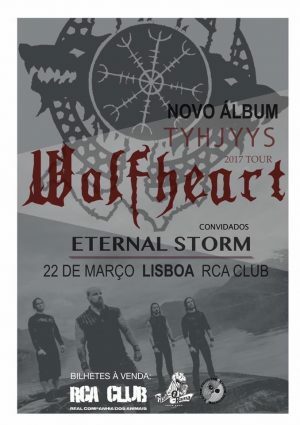 Os Wolfheart regressam a Portugal a 22 de Março para nos apresentar em primeiríssima mão o seu novo álbum TYHJYYS uma palavra Finlandesa quase impronunciável para nós, sinônima para Vazio absoluto. Tuomas Saukkonen vocalista e mentor da banda que já conta com um passado extenso em projectos belíssimos como Before the Dawm e Black Sun Aeon, promete-nos um concerto Avassalador. O que não duvidamos porque sabemos bem a Mestria e preciosismo que só se arranja por aqueles lados da Escandinávia, os bilhetes em pre-venda custam 13€ e no dia a 15€! a não perder!! NOTA: Como é a meio da semana e para se conseguir ter um alinhamento coeso e conseguirmos terminar as hostilidades até as 23:30, tempo mais que suficiente para se beber mais um copo e trocar meia dúzia de ideias e regressar em segurança a nossas casas, optámos por ter apenas uma banda de abertura; – sendo assim, nada melhor que ficarmos apenas com os Madrilenos Eternal Storm que vão acompanhar os Wolfheart em todos os restantes concertos da Iberian Tour!! Sendo esta a estreia deles por Portugal!! A Pre venda faz-se através de mensagem privada pelo nosso FB com várias formas de pagamento, e fisicamente na GlamOrama e no próprio RCA , contamos convosco!! Passem a palavra!! \m/, Metal On! 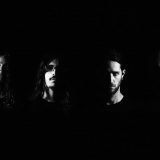 Be the approach melodic and hopeful, acoustic and fragile, harsh black/death metal or atmospheric doom, “Winterborn” has it all, in a mix like of which you haven’t heard before. Saukkonen recorded and released “Winterborn” entirely by himself playing all the instruments and doing all the vocals, with Mika Lammassaari (Eternal Tears Of Sorrow, Mors Subita) as his only guest, playing guitar solos. “Winterborn” proved a roaring critical success scoring high ratings in reviews left and right. To cap off a great year for his project, “Winterborn” was elected the best debut album of 2013 in the annual Record Store Äx customers’ poll. Wolfheart deserved to be a fully operating band. Also big european / scandinavian festivals were targeted and the climax of the 2015 was the 2nd album “Shadow World” which continued the path of critical praises and was the first product from the co-operation with Spinefarm records (Universal). After a rapid ride since the release of the debut and second album the band cleared the calender in the beginning of 2016 and started the pre-production of the 3rd album in the legendary Petrax studios (CoB, HIM, Korpiklaani etc). Only few selected festival shows were booked to break the studio cycle but the focus has been intense and the scheduled release of the new album is set to the beginning of 2017. January 2017 Wolfheart is heading back to tour Europe with Insomnium and Barren Earth and more shows and festivals for 2017 to be announced! Eternal Storm is a Melodic Extreme Metal band that was created in late 2006 under the name of Death Valley by Kheryon (vocals) and Tephros (drums, ex-Beneath Your Fears) along with another musicians. The band pretended to play some kind of symphonic black metal but went into a hiatus shortly after. Some later, in late 2007, Kheryon (now playing bass too) and Tephros reformed Death Valley and brought Daniel Maganto as guitarist. After a few rehearsals Daniel invited his friend Jaime Torres to join as second guitarist: now that a line-up was established they started to write music in the vein of old school melodic death metal with some black metal touches and other traces of their own, blending aggression with melodic guitar work and epic riffs as well as atmospheric nuances. Tephros left the band some time after due to schedule problems. The band spent a short period as a trio and then a couple of months jamming with Carlos Gumuzio (currently in The Descent), who would eventually leave the band in order to spend more time in his other projects as a vocalist. During mid 2009 Death Valley changed his name to Eternal Storm just before recording their first songs: the new name shows the progression in the band’s style and concept. In October 2009, Ramón Mejías de Salas joined Eternal Storm and the quartet started to perform their first shows. After some difficult times which followed Ramon’s departure, it was in July 2011 when Luis “Lucho” Rodríguez from the almighty progressive metalheads Distance defined the lineup and some months later recorded what would become their debut EP ‘From the Ashes’, which was released in Spring 2013 and was critically acclaimed internationally, gaining them the title of the “Most Promising Band of 2013″ by the respected webzine TheDrinkTim. Shortly after the release of their debut EP the band played numerous shows all over the Iberian peninsula and including a slot at the well-known Portuguese extreme metal festival SWR Barroselas, apart from opening for legendary acts such as The Black Dahlia Murder, Leprous, Lock Up or Blindead. Four-piece Melodic Extreme Metal band from Madrid. 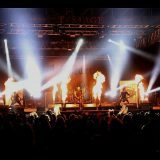 Formed as Death Valley in 2007, after a long hiatus, several line-up changes and a continous evolution in their music, the band changed their name to Eternal Storm during May 2009. First EP ‘From the Ashes OUT NOW! Members also play(ed) in Liquid Graveyard, Teething, Under Vultures, Clockwork, Outer Heaven and The Ytriple Corporation.